We're pleased to announce a new collaborative fundraising project between Access the Animus and The Ones Who Came Before for Eagle Heights Wildlife Foundation! 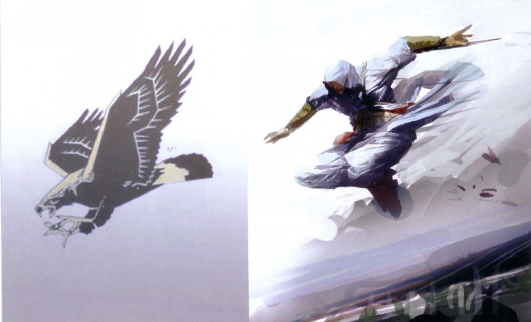 Access the Animus and The Ones Who Came Before are two fan projects dedicated to the Assassin's Creed video game series, which has spanned for more than 10 years now. As eagles have always been a very important and symbolic element of the franchise, the two fan projects decided to team up with the Eagle Heights Wildlife Foundation and have a positive and meaningful initiative that doesn't just deal with fan content about video games, but can also have a more direct and real impact. Eagles/Animals in general have never been supported by the Community before. We take Eagles for granted, with them appearing in every game/project and this would be the perfect occasion to support an organization that takes care of them. Eagle Heights is a Not for profit foundation located in the village of Eynsford, UK, that was started in 1996 and is now home to one of the UK's largest Bird of Prey Centres, with a collection of approximately 100 raptors over 50 species. The foundation has also become a wildlife sanctuary and house for many different species of animals, including Meerkats, Servals, other mammals, Reptiles and Birds. At the moment the foundation provides Falconry Experience Days, Animal Experience Days, Husky Experiences, Animal adoptions and more while at the same time is very actively involved in rehabilitation of wild rescued birds, conservation of the environment, breeding and bringing the animals to the schools to help children understand the environment that they will one day be responsible for.